On 29 May the Fukushima Local Meteorological Observatory reported that seismic activity increased slightly beneath Azuma during May. The Coordinating Committee for the Prediction of Volcanic Eruptions' seismic network detected 51 small-magnitude volcanic earthquakes during 21 and 22 May and 39 on 21 May (the most recorded in one day since November 1998). During March four low-frequency tremor events were recorded, while 40 were detected in April. On 29 May 2001 the Fukushima Local Meteorological Observatory reported that seismicity increased slightly beneath Azuma during the month. The seismic network maintained by the Coordinating Committee for the Prediction of Volcanic Eruptions detected 51 small volcanic earthquakes during 21-22 May and 39 events on 21 May (the most recorded in one day since November 1998). During March four low-frequency tremor events were recorded, and 40 were detected in April. The observatory last reported that by 22 May, local residents had felt 33 earthquakes. Information Contacts: Volcanological Division, Japan Meteorological Agency, 1-3-4 Ote-machi, Chiyoda-ku, Tokyo 100, Japan; The Japan Times; 5-4, Shibaura 4-chome, Minato-ku, Tokyo 108-0023, Central P.O. Box 144, 352, Tokyo 100-8691 (URL: http://www.japantimes.co.jp/). The number of volcanic earthquakes at Azuma, including some felt events, began to increase in September and continued at an increased rate in October. On 26 October, the fume cloud rose about 400 m from Oana Crater on the SE flank of Issaikyo, one of the numerous stratovolcanoes that comprise the Azuma complex. Mud and sand spattering began, and fist-sized blocks were thrown 20 m above the crater. Active fuming continued through November. A brief eruption from Oana was observed during the early morning of 7 December from Fukushima Meteorological Observatory, about 20 km to the E. The ash cloud rose 500-1,000 m above the crater and produced a slight ashfall nearby. Similar ash ejections occurred through the end of December. Information Contacts: JMA, Tokyo; Y. Sawada, Meteorological Research Institute, Tokyo; D. Shackelford, USA. Steam and ash emissions continued in January, with plumes rising 300-500 m from Oana crater. Information Contacts: JMA, Tokyo; D. Shackelford, USA. Small-amplitude volcanic tremors were detected on 26 April and 26 May. The last eruption occurred in December 1977. Earthquakes began in September 1977, followed by mud and sand spattering and ejection of small blocks in October, and active fuming in November. The small eruption on 7 December 1977 sent ash 500-1,000 m above the crater and produced minor ashfall. Similar ash ejections occurred through January 1978 (SEAN 03:01 and 03:02). Small-amplitude volcanic tremors were detected on 10, 17, and 30 June, and on 27 July. The Azumayama volcanic group consists of a cluster of stratovolcanoes, shield volcanoes, lava domes, and pyroclastic cones. The andesitic and basaltic complex was constructed in two E-W rows above a relatively high basement of Tertiary sedimentary rocks and granodiorites west of Fukushima city. Volcanic activity has migrated to the east, with the Higashi-Azuma volcano group being the youngest. 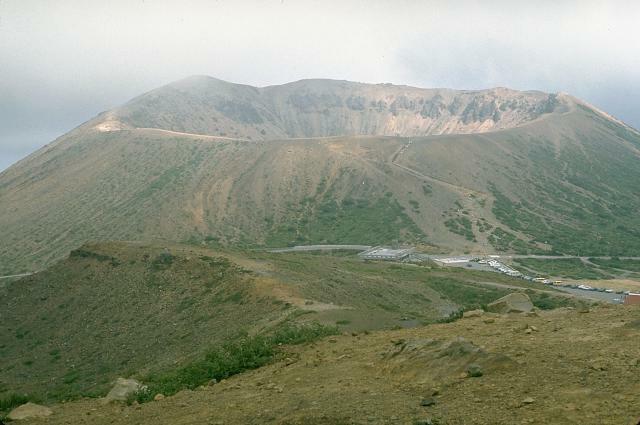 The symmetrical Azuma-Kofuji crater and a nearby fumarolic area on the flank of Issaikyo volcano are popular tourist destinations. The Azumayama complex contains several crater lakes, including Goshikinuma and Okenuma. Historical eruptions, mostly small phreatic explosions, have been restricted to Issaikyo volcano at the northern end of the Higashiyama group. Sumi K, Takashima I, 1976. 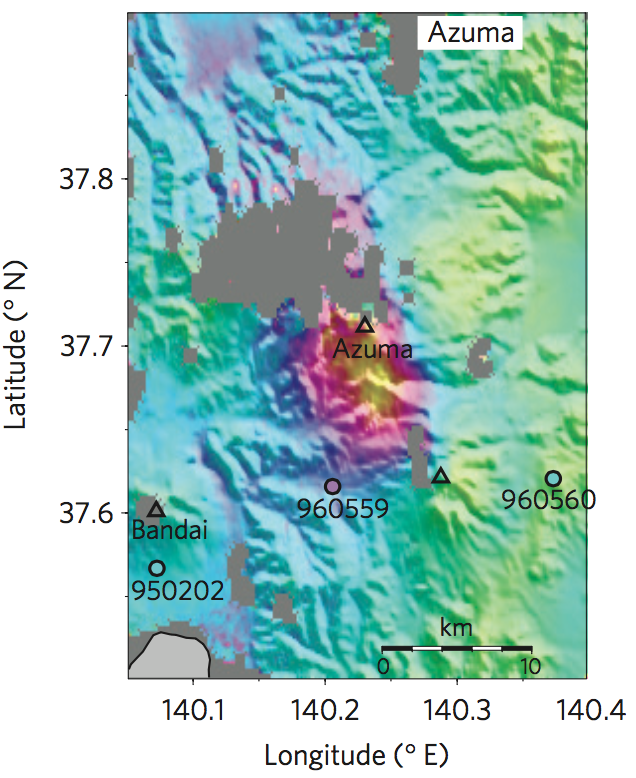 Absolute ages of the hydrothermal alteration halos and associated volcanic rocks in some Japanese geothermal fields. In: Proc 2nd United Nations Symp Devel Use Geotherm Resour, San Francisco, 1: 625-634. There is no Emissions History data available for Azumayama. The symmetrical cone of Azuma Ko-Fuji, truncated by a 300-m-wide crater, is one of many volcanic features of the Azuma volcanic complex. The Azuma volcano group consists of a cluster of stratovolcanoes, shield volcanoes, lava domes, and pyroclastic cones. Volcanic activity has migrated to the east, with the Higashi-Azuma volcano group being the youngest. This photo was taken from the NW on the flanks of Issaikyo-yama, which has been the site of all historical eruptions (mostly small phreatic explosions) from the Azuma complex. Large Eruptions of Azumayama Information about large Quaternary eruptions (VEI >= 4) is cataloged in the Large Magnitude Explosive Volcanic Eruptions (LaMEVE) database of the Volcano Global Risk Identification and Analysis Project (VOGRIPA).